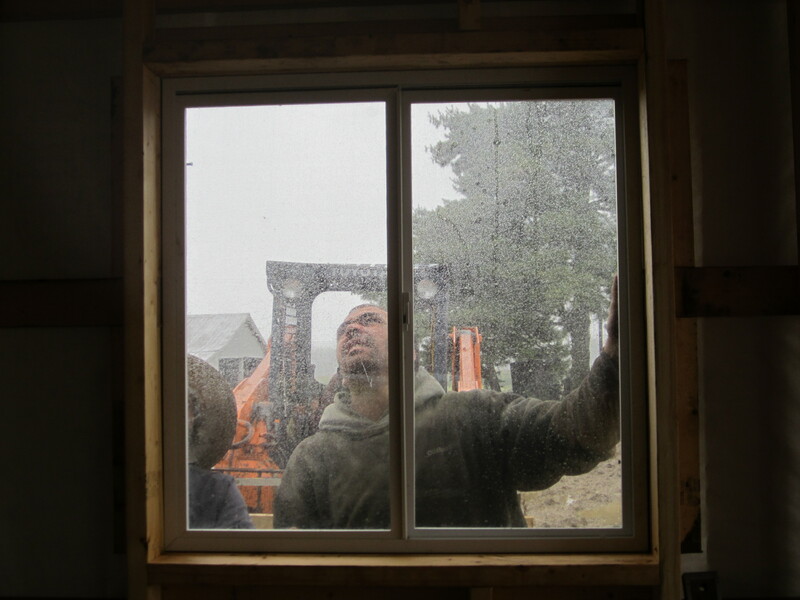 Rain, rain, go-away…We have to work either way! 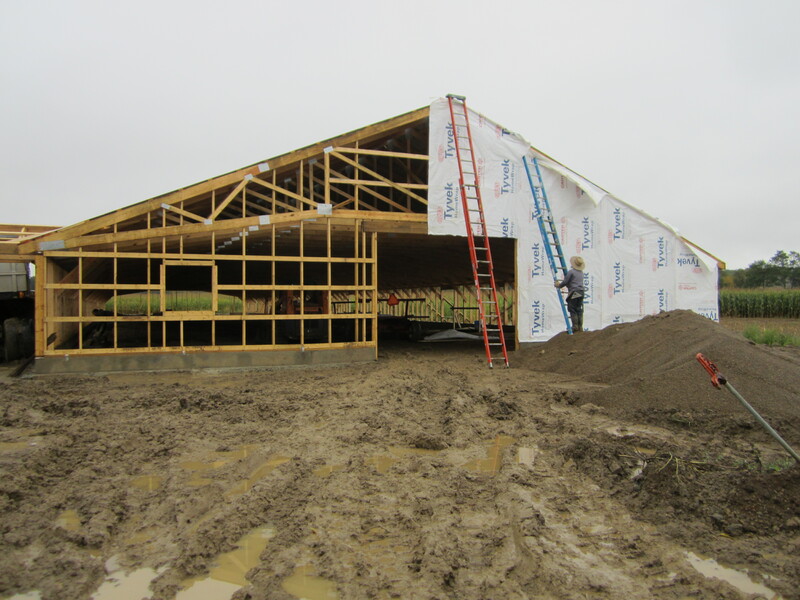 Despite the constant rain showers we’ve experienced, work has continued to progress on our breeder house. Next on the to-do list: put some wall covering up to keep the elements from our flock. As the author of this blog, I have to ask many questions about the building and the process of constructing it. I was sure there was some deeper meaning to the colors selected for the siding. I rationalized that white was selected to reflect heat. The green trim at the bottom was surely there to keep the building looking clean. After all, if white siding was run clear to the bottom, mud and muck would build-up around the bottom and make the house look dirty…right? Wrong! 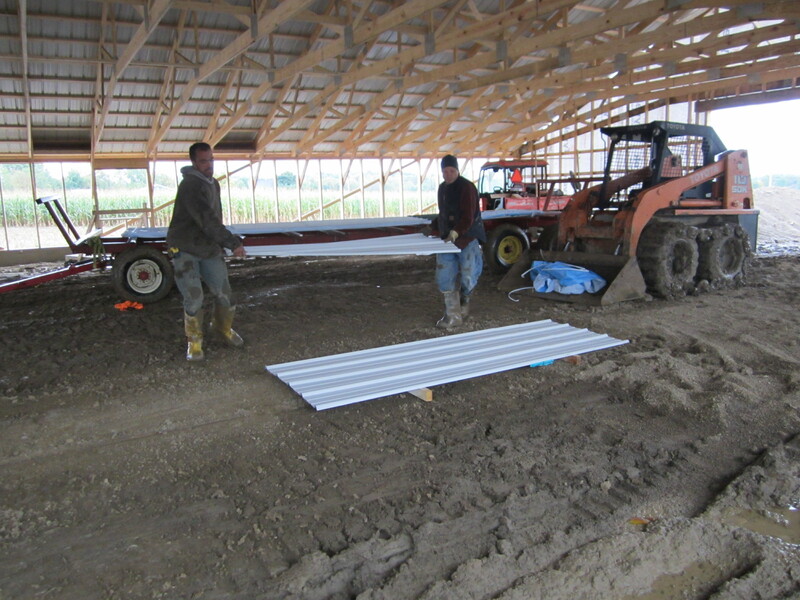 Meyer Hatchery owner, Karen Meyer, has always wanted a white and green barn. She’s never realized that dream until now since her homestead consists of traditional red and white outbuildings, she felt any new construction on her property had to fall in line with that same palette. No one wants a farm that clashes! 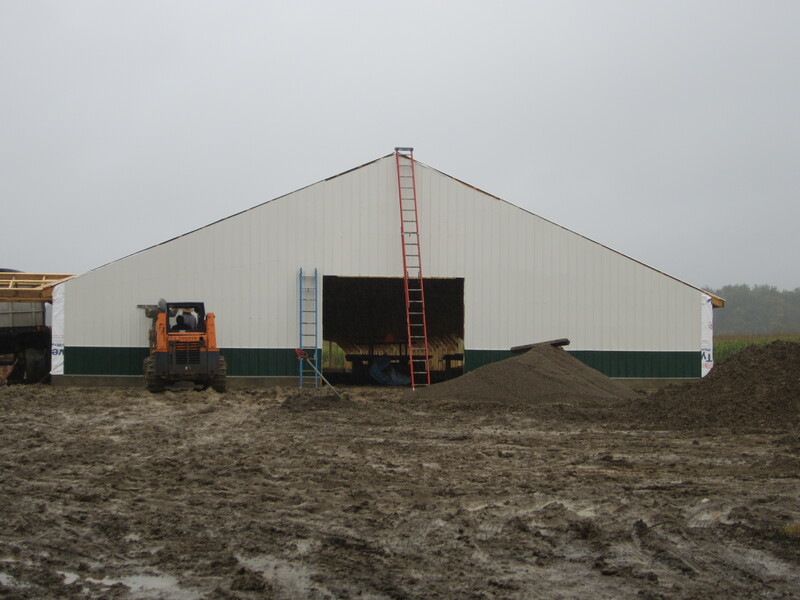 Since we keep our breeder flocks separate from the hatchery, she was able to finally build her green and white barn. Silly, me; always over analyzing. 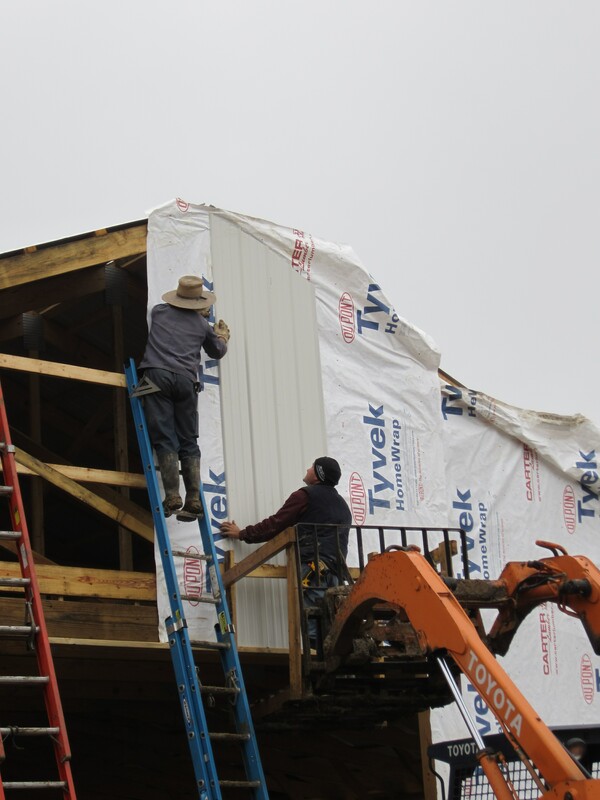 Before the siding could be applied to the building, we had to secure the Tyvek covering. Seems easy enough, but of course, this day the wind and rain made things a little more difficult. None-the-less, the crew carried on. 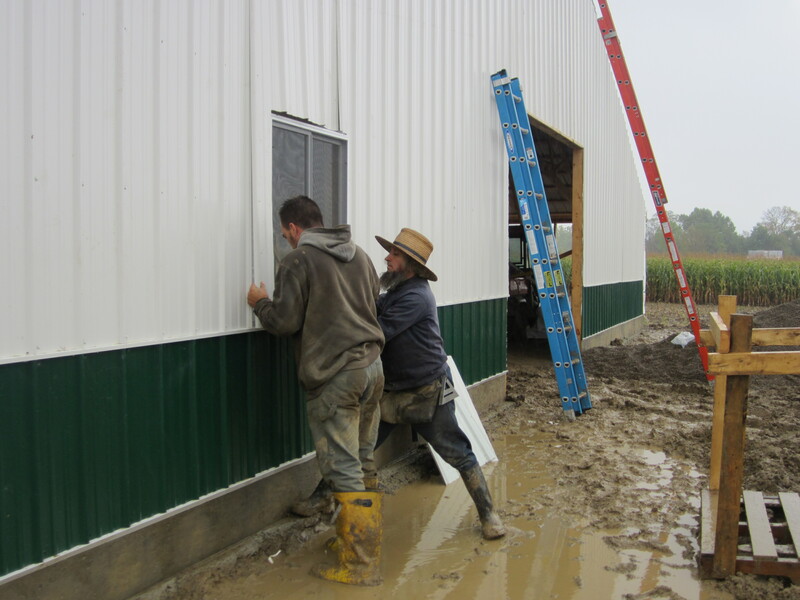 As long as they covered the front of the building, we could get the ceiling in the following day and worry about the three remaining sides later in the week. Harvey, making sure the ladder is set in place. Notice the mud…everywhere?! 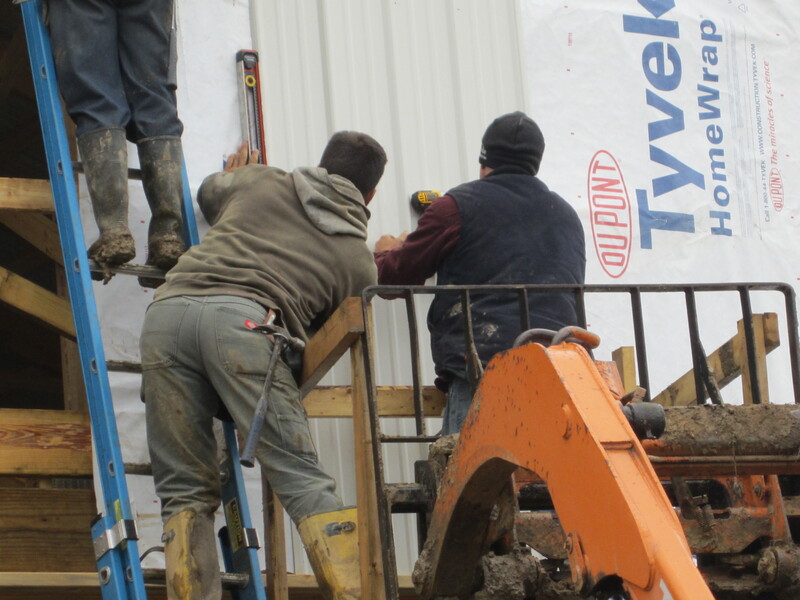 While Harvey prepared the outside in the rain, wind, and frigid temperatures, Russ and Bob were hard at work…or hardly working! Just kidding! They were coerced into taking a break for a photo. 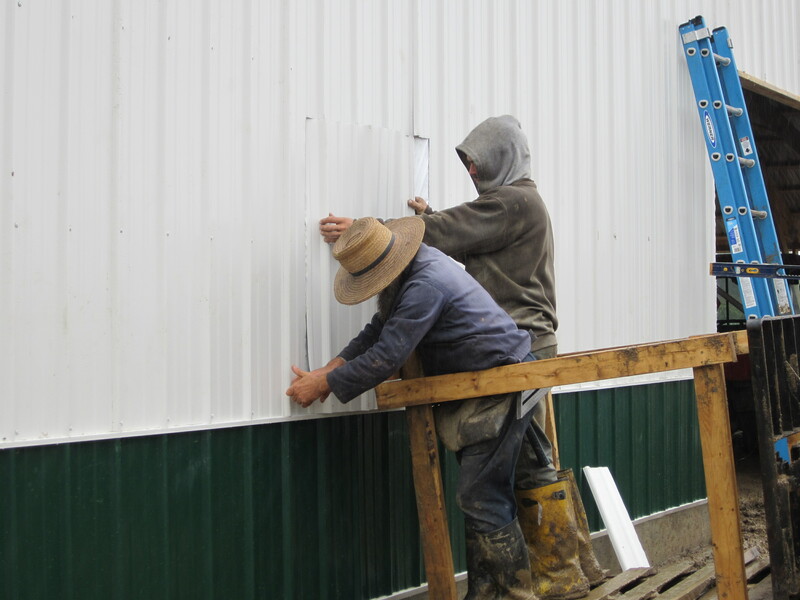 They quickly got back to their work cutting and sorting the metal siding sheets to the perfect size. As I understand, it’s a little easier to do this BEFORE it’s secured to the building 🙂 Makes sense. Before long, everyone was ready to fasten the sheets to the house. After many measurements, cuts, and screws the front was nearly covered and finished, except for a small window. Cutting away the siding to make room for a window. Did we plan on enough room for a perfect fit? Of course! Fits like a glove. 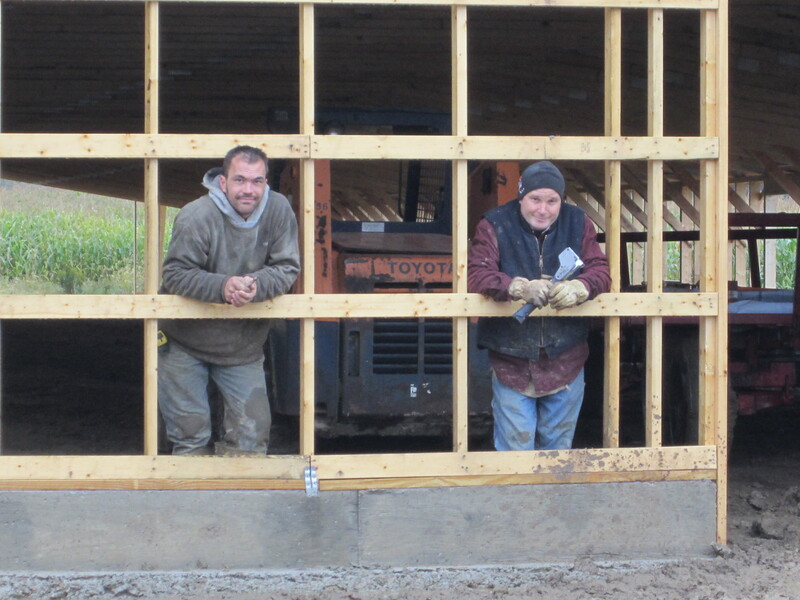 By the end of the day Russ, Bob, and Harvey were able to finish enough of the siding so the ceiling crew could come into work the following day. Way to go guys! The project is coming along nicely. Check back soon for another update.